Things keep looking up (way up) for MESA alumnus Victor Glover. 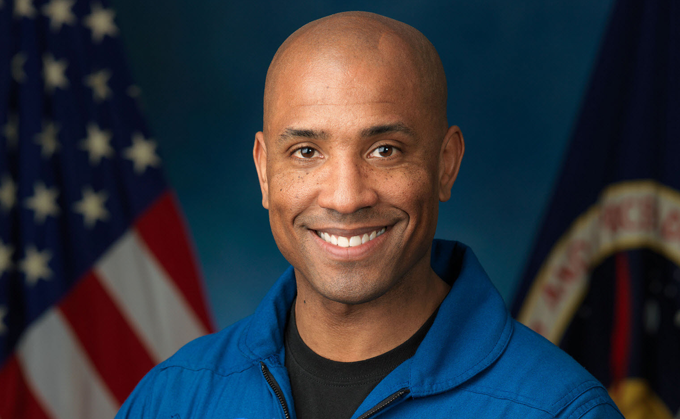 NASA announced this month Glover is one of the crew set to fly on SpaceX and Boeing spaceships. These will be the first major flights on commercial craft by NASA astronauts and the first time astronauts have traveled to space from American ground since the Space Shuttle program ended. This will be Victor’s spaceflight debut, but as a Navy commander, Naval aviator and test pilot he’s got almost 3,000 hours flying in more than 40 different aircraft, 400 carrier landings and 24 combat missions under his belt. “Every moment in this experience is going to be the first so I’m really looking forward to it,” Victor said after the announcement. Crewed flight are scheduled to begin in 2019. Victor will be aboard the SpaceX’s Crew Dragon spacecraft atop the Falcon 9 rocket headed to the International Space Station for a long-duration mission. Victor launched his career with MESA as a fifth grader when he competed in MESA Day contests. Applying the math and science concepts gave him early interest in being an engineer, but he gained even more as an engineering major at Cal Poly San Luis Obispo. He would visit local middle schools to tutor MESA students in physics concepts through projects like mousetrap cars and egg drops. Helping students understand “Why do I need to learn this?” solidified his love for both math and giving back. He continues to be an inspiration to MESA students. He was named the 2016 MESA Distinguished Alum and addressed students about MESA’s impact and the need for diversity in STEM fields. We’re so proud Victor is part of the MESA family! We’ll stay posted on his cosmic course.